During late 1880, North Pine was first gazetted as a place where a Court of Petty Sessions would be held. Hugh O’Loan (1838-1914), the well-known local North Pine Police Sergeant, was also appointed the first North Pine Clerk of Petty Sessions and District Court Registrar on 4 November 1880. It cannot be a coincidence that Tom Petrie was appointed a Justice of the Peace only a week later. The first Court was held on 31 January 1881 in a temporary building, the old schoolhouse located in the reserve. On 26 October 1882, the Department of Public Works and Mines called for tenders “from persons willing to contract for the erection of a Court House at North Pine River”. Tenderers were advised to obtain plans and specifications from the Department, or from the North Pine River Police Station. The new timber courthouse stood at the site of the later brick courthouse from 1882 until 1965. Following its removal and use by the Kallangur Baptist Church, the building was eventually moved to the North Pine Country Park (Old Petrie Town) and faithfully restored. 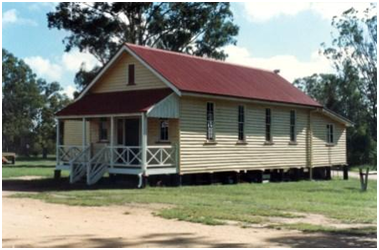 It was the first building to be moved to the park in 1982, and it is the oldest known government building preserved in the Pine Rivers District, apart from the old Police Cell Block which now stands next to it in Old Petrie Town. In keeping with it being a ‘Court of Petty Sessions’, only minor offences were dealt with at North Pine. The Register of Fines held by the Queensland State Archives reveals that the most common offences during the late 19th century were the following: ‘drunkenness’, ‘obscene language’, ‘assault’, ‘disorderly conduct’ and ‘illegally using a horse’. More serious offences included ‘sly grog selling’ and ‘illegally branding’. Many cases were reported in the Brisbane newspapers of the time. The brick courthouse, which superseded the timber building, was officially opened on 17 December 1965. Petrie’s link with the provision of justice services was finally severed by the opening of the new $11 million Pine Rivers Courthouse in Strathpine on Saturday 13 September 2008. The North Pine Courthouse, shortly after removal to the North Pine Country Park. Queensland Government Gazette, 28 October 1882, p.1079.